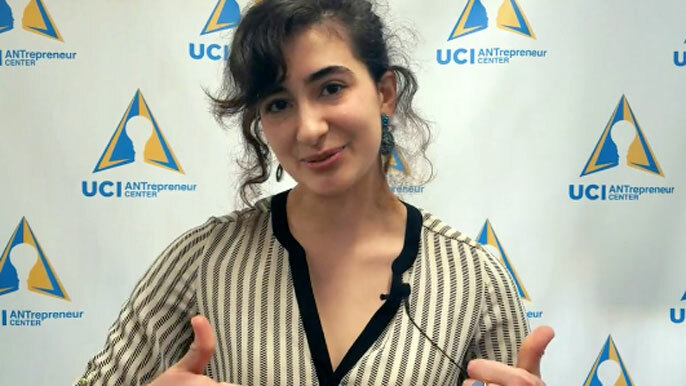 A still from UC Irvine student winner Sarah Brandenburg's video, in which she describes her startup, MyMechanic. Nineteen UC entrepreneurs will get a chance to meet and pitch some of Silicon Valley’s leading venture capitalists next month at a special lunch hosted by UC President Janet Napolitano and Christine Gulbranson, UC’s senior vice president of innovation and entrepreneurship. The winners were chosen randomly from more than 340 students, faculty and staff who recorded personal videos from their offices, labs, dorms and video recording parties this past winter and submitted them to the “I am a UC Entrepreneur” campaign. On May 5, this lucky group will lunch with Napolitano, Gulbranson and VC leaders Brook Byers, of Kleiner Perkins Caufield & Byers (KPCB); Josh Green, of Mohr Davidow Ventures; and Brendon Kim, of Samsung NEXT. Entrepreneurs from each campus will be represented at the May 5 lunch. Click on the names below to see the winning #UCEntrepreneur videos.